Did you know that more than 80 percent of all reported motorcycle accidents end in either injury or death? This percentage is huge compared to cars and trucks. The major difference is obviously that motorcycles offer very little protection between the driver or passenger and the road or the vehicles around them. Ejection from the motorcycle is extremely common, resulting in some of the most dangerous motorcycle injuries. 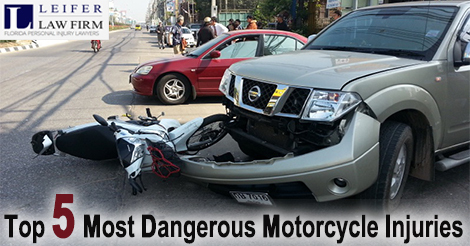 Read more about the various causes for motorcycle accidents. Regardless of how serious your injury may be, if it was the result of someone else’s fault, you may have a personal injury case on your hands. Talk to a Boca Raton motorcycle accident attorney to discuss your legal options. Head injuries can result in traumatic brain damage. This type of injury is actually the leading cause of death and permanent disability in motorcycle accidents. Part of the reason that this type of injury is so common is because many riders will be thrown from the motorcycle if an accident occurs. Florida law requires that motorcycle riders and moped riders wear helmets under a certain age, but there are some exceptions. Motorcycle CrashThe Center for Disease Control reports that roughly 22 percent of all motorcycle accidents cause injuries to the head and neck. These injuries can be extremely serious because this type of injury can result in damage to the spinal cord. You risk becoming paralyzed or seriously injured when you have damage to the spinal cord. Wearing a helmet that also supports your neck can help avoid these types of injuries. Leg and foot injuries are extremely common in motorcycle accidents. In fact, they make up roughly one-third of all injuries that occur after a motorcycle accident. This is because when motorcycles crash, they often fall over on top of the rider’s legs or feet. Sometimes these types of injuries can shatter the bones, causing serious, long-term damage to the legs or feet. “Bikers’ arm” is extremely common after a motorcycle accident. This occurs when you try to stop yourself from falling during or after a motorcycle accident. You are moving so fast that you end up dangerous motorcycle injuries your arm, hand, wrist, or the nerves in your arms. There isn’t really a good way to prevent this type of accident, but padded jackets and gloves can help. A broken wrist can require surgery and may cause long-term pain and problems. Damage to the muscles and skin is extremely common after a motorcycle accident. Road rash occurs when your body actually slides across the pavement after a motorcycle accident. You can help prevent these types of injuries by wearing protective gear that covers your skin completely. The road can tear through regular clothing quickly, just like it can tear through your skin, so protective gear is a must if you want to avoid this very painful injury. Muscle damage after a motorcycle accident can actually cause permanent problems as well. Many other vehicles on the road do not look out for motorcycles as they should, and an accident with a car will likely cause much more damage to the motorcyclist than to the driver. You should always make a visit to the hospital if you are injured in a motorcycle accident. You may not realize just how injured you are—internal injuries are difficult to detect right after an accident. Once you have addressed your health and safety, call a motorcycle accident attorney in Boca Raton to determine whether you have a personal injury claim. Do You Know the Common Motorcycle Accident Facts?